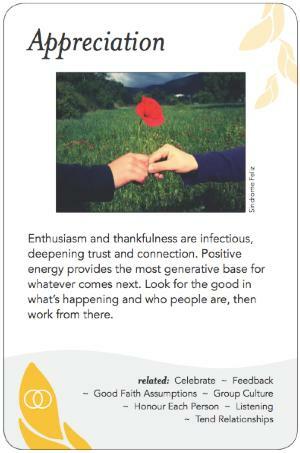 Enthusiasm and thankfulness are infectious, deepening trust and connection. Positive energy provides the most generative base for whatever comes next. Look for the good in what's happening and who people are, then work from there. Expressions of enthusiasm and gratitude can carry with them enormous positive energy that can push a group past obstacles, streamline consensus, and/or spark creativity. Explorations of something's positive worth can deepen understanding and lead to discovery of why something is working well and how it can be built upon or replicated. Expressions of thankfulness can deepen relationships and build trust and respect. Turning around negativity can reframe something that appears dreadful or insurmountable that can only be addressed by struggle ("urban gang crimes") as something that provides the opportunity for pleasurable change activities ("helping young people find meaningful work") can refocus activities to be much more visionary and productive. Accepting something (that cannot readily be changed -- a problem that is really a predicament) instead of fighting against it can enable a shift from futile confrontational and "banging heads against a brick wall" tendencies, to useful adaptive, preventive, improvisational and mitigating actions. A good facilitator will model appreciative behaviour and improve energy, effort, creativity, trust, learning, productivity, consensus, effectiveness and collaboration by drawing out in participants each of these five ways of looking differently and positively at things. Peter Block's book on Community. David Cooperrider's work on Appreciative Inquiry.